COMMUNITY ACTION FOR PORVERTY ALLEVIATION (CAPA) seeks to generate funds and partner with various institutions and individuals in orther find innovative solutions to the systemic challenges that stand in the way of smallholder farmers adopting soil health technologies and promoting effective solutions to poverty problems. 75% of people living on $1 a day work in agriculture. CAPA believes we are still at a point where Improving soil health is essential to reversing the low productivity that has plagued Africa’s smallholder agriculture over the past 40 years. During this period, for example, the average yield of maize a staple food crop in Africa, has stagnated at about 1 MT/ha. Unfortunately, due to continual mining of soil nutrients over time, without sufficient replacement, Africa’s soils – particularly on small land holdings steadily lost their ability to support strong crop growth. In order to transform African agriculture, farmers must start using fertilizers in much greater quantities than currently, and apply it in appropriate ways to ensure financial and environmental sustainability. 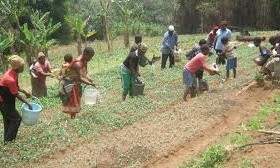 The Governments of many African Countries and other actors have provided several solutions similar to what we want to offer but have no succeeded because they focus on one arm of the supply chain forgetting the other for instance there would be a mass campaign on sensitizing local farmers on how to use fertilizers and they would be offered free fertilizers.It has been a great program but after the farmers have a large harvest they can not manage to do so the following year when the program is no longer there.